With the recent deaths of foreign correspondent Marie Colvin and French photographer Remi Ochlik there is the expected outcry about the Assad regime in Syria just trying to kill everyone with impunity. What makes the death of Colvin having some irony to me is that the first time I had ever seen/heard from her reporting was just the night before on a segment of Anderson 360. I had never heard of her and never had seen her before, and given she had the distinctive patch over her left eye I would have easily remembered her. Then in a few hours after that report she is reported dead herself. She and her French associate will be remembered like all reporters who have been killed in the line of duty before her, in all the various wars and police actions of the last 100 years. These people have a unique dedication to humanity in that in reporting the truth of human suffering the world can take notice and maybe do something about it. I am reminded of a number of news correspondents and journalists in the past decades that also were killed trying to report the truth. Many of these reporters and journalists are not commonly known to the average joe on the street, but some are. We all recall the death of Daniel Pearle recently, but most notably I recall the execution of ABC news reporter Bill Stewart back in 1979 by Nicaraguan government forces. He was a face I did see on TV from time to time. The following is an exerpt from Wikiepedia’s discription of his death. A still shot from the film (real). On June 20, 1979 Stewart was travelling in a van in the capital city of Managua with his camera crew when they were stopped at a checkpoint run by the Nicaraguan National Guard, the main force of President Anastasio Somoza Debayle. The van was marked as a press vehicle as a precaution. The young lieutenant in charge of the checkpoint saw Stewart peer out of the passenger window and ordered him out of the vehicle. Stewart was accompanied by Juan Espinosa, his interpreter. Stewart held a white flag and official press documentation from the Nicaraguan government. While Stewart was escorted a few meters away from the van his cameraman, Jack Clark, began filming the scene. Clark filmed as Stewart was forced first to kneel and then to lie face down on the ground. The lieutenant then put his rifle to the back of Stewart’s head and fired, killing the reporter instantly. Espinosa was killed moments later. The video footage shocked colleagues at ABC, and it and the other US networks ran the footage in their evening news broadcasts. Over the next few days the footage was broadcast repeatedly in the United States and around the world. This horrified the American public and ultimately caused the US government to turn openly against Somoza’s tottering regime. 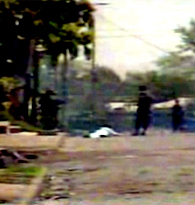 Before the shooting, Nicaragua had been a controversial subject. Most US officials argued Somoza and his regime must be kept in power as a bulwark against Communism. The dramatic surge in public anger following Stewart’s murder made that position untenable. Support for Somoza was withdrawn and he was toppled less than a month later on July 19. I remembering watching that video being replayed on the news and I did feel a human rage thinking what it must have been like for the others in his crew to just sit there and watch all that for fear of their own lives in that volitile situation. If they were soldiers they might have been able to strike back. But they were there by their own choice as non-combatants. I got to wondering over the years why the press always seems to presume they should be immune to the things they are reporting on simply by holding up their press passes. War is war… people die.. the innocent and the press included. Do the press really believe that their press pass places them in some kind of protective bubble? Soldiers engage in war and killing because they have been called to serve to represent their governments or are dedicated to changing their governments. Innocents are casualties of war simply because they are part of a human suffering in the crossfire. But reporters have a choice to be in harms way or not… and for what reason? These folks who feel compelled to enter the danger zones of the world are not doing this just for a paycheck… or fame and fortune. Or is it? I mean, it’s the dream of most combat photographers to take the one picture of suffering humanity that represents the feelings of an entire conflict and have it on the cover of LIFE magazine (TIME magazine these days). One would presume that it’s a dream of reporters to report to the world first hand the “true” suffering and atrocities of a renegade dictator. I’m not suggesting that having a desire to achieve greatness personally in a field of endeavor that can also serve humanity is bad or somehow less than being morally pure. But combat reporters (including reporters in conflict areas) seem to go about their jobs in this bubble… viewing their subject from an outside perch which they think affords them physical protection from the ravages around them. They know that once they are done reporting on the human suffering they can go home at some point. They know that the pain and suffering and hunger as a result of war that they are reporting on does not include themselves; at the end of the day they will go back to their hotels and live off of logistics provided or arranged for by their employers, the networks and news agencies. Oh sure.. it’s not anything four star, but even an MRE is better than nothing at all when compared to the rest of the starving humanity around you. Perhaps the normal fear of personal safety is still there.. as in Syria where shelling and rockets are landing indiscriminately everywhere. It would sure scare the hell out of me as well. But my whole point here is not to belittle the personal sacrifices of reporters in conflict areas and war zones but rather to try and understand why it seems they continue to risk their lives under what seems to me to be an imagined perception that just because they are reporters that they will be safe and protected. While one might presume that a reporter is reporting for more than just an income to support his/her family.. that maybe there is also an altruistic reason to help their fellow man by reporting the truth, their bosses back home in Atlanta, London, New York, wherever, are hiring them to do that for money and ratings. Many of these reporters and their crews have long resumes of achievements and are respected in their industries. 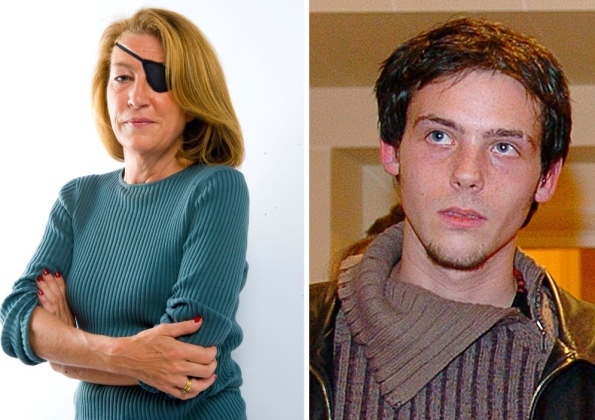 Marie Colvin and Remi Ochlik are no exception. But they are dead now, casualties of what they were reporting on. Is it going to be their work that will be remembered or the sensationalism brought out by the fact that here are two “innocent” journalists who were intentionally killed by a free press hating President Assad? In a way I don’t like having my opinion being manipulated like that. In the same way I am also wondering about another reporter in the region, Arwa Damon. This CNN reporter seems to have covered every Mid East conflict since Desert Shield. Actually I am surprised she’s lived this long in the region given her western looks (her mother is Syrian). She’s on TV so much I don’t think she’s even had a vacation in the last 10 years (I’ve never seen her smile… which likely means she needs a well-deserved vacation). My point here is, how far will she go before her press “arrogance” makes a miscalculation and she ends up a casuality of her own reporting. Let’s hope she remains around for the next 20 years or so to write her book. My opinion in this post likely represents a common opinion.. or certainly one common opinion of reporters, out of many out there. 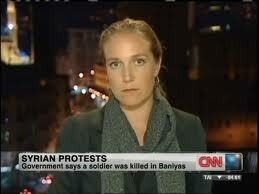 I have never been a reporter, much less a reporter in a conflict or combat zone. I have not walked a mile in their shoes therefore I can’t imagine what they do go through. All I know is that someone is paying them to risk their lives to show me how bad I am as a human being that somehow my inattention to some Third World conflict is causing people to suffer and die. Not sure I want all that guilt… and after all, just how much guilt can any American have for having it all while another country doesn’t? Maybe that’s the crux of this entire discussion. I prefer my reporters to report to me the news.. not be a part of it. It’s tragic when they die but it seems political martyrdom is usually an end result rather than respect for their achievements. This entry was posted in Social Issues and tagged Anastasio Somoza Debayle, Jack Clark, Jon Stewart, Nicaragua, Somoza, Stewart, Syria, United States. Bookmark the permalink.